Home » All Forums » [Lunch & Dinner Forums] » Prime Cuts » Best "neighbourhood" steakhouse in your town? Best "neighbourhood" steakhouse in your town? No. My kids are way smarter than me. In Milwaukee, its the 5 O Clock club, best steaks in town. Honestly. Jim, I totally agree about the kid thing. Having two (now adult) kids, I feel I've already served my time in hell. Ditto, I have four (youngest is 31). When my kids were infants to 12 we didn't even think of taking them with us to a "white tablecloth" joint. Not so here in Dallas. Further, when my kids were fussy, we took them outside until they settled down. Not so here in Dallas. Worse, some parents even goad their terrible twos into "expressing themselves", thinking it's "cute" for them to squeal and blabber. Yikes! Btw, lucky for you $wise, the Princess does't partake in alcohol. Yes, big $aving$ there over several of my ex-es (none of whom live in Texas). When we dine out I get any side she is served that has bacon in it. And, she doesn't smoke, raise her voice, or even curse! Not being allowed to carry cash (she handles the household finances and accounts for every penny) is a small price to pay, especially as my students think that she is a dead ringer for Nicole S-(something), the lead singer of the Pussycat Dolls! Indeed, she has cleaned up my act quite a bit in our years together. Hepcat, Great thread. Metroplex Jim, I agree, we loved JR's....it has been "Temporarily Closed" for a while...sad. A couple of other long gone haunt's that we loved were The Sitting Duck Pub at Evan's Farm Inn and The Country Squire in 7 Corners. My parents started going to those spots in the late 60's and then my wife and I did in the early 80's...Ah, memories. Thanks! Milwaukee is blessed to have several local neighborhood steakhouse to go with usual chains such as Flemings and Capitol Grille. Ann mentioned the Five O'Clock Club which is an excellent choice and a bit of time travel taking one back to the late 40's. Dobie's in St. Francis is another. It's one of the last serve a comped lazy susan to begin your meal with liver pate, and 3 bean salad among the offerings. Ala carte they serve an amazing potato they call hash browns but really is similar to a roesti. My personal favorite steakhouse is Jimmy Jackson's Jackson Grill. The steaks are as good as you can find anywhere in town but the atmosphere and side dishes set this apart. You still get soup or salad and your choice of starch. You can't go wrong with lobster bisque which is always available or the soup of the day and all salad dressings are house made with the hot Nueske's bacon dressing or French cognac the two standouts for me. Each steak is topped with a large Portabella so good I could give up meat if all veggies could taste this good. They also have a sprinkling of caramelized garlic that tastes like a sweet garlic jujube. Among the starch sides are imho Milwaukee's best french fries (something that spoiled me for anyone elses) and his mac 'n cheese, which actually is bowtie pasta with a four cheese Alfredo sauce. Try a pork Porterhouse for a huge pork chop that with closed eyes would have you swearing it's beef. Jimmy's pop had a steakhouse near the old Mlwaukee County Stadium, Ray Jackson's House Of Prime, where pro baseball and football players went to unwind. He got many to sign mirrors which now hang in the bar of the Jackson Grill. My unlocal favorite, Ted Kluszewski is one of many. Smith Brothers looks like a winner! It's a new one. They've been advertising their friendly prices on Q107 radio, and it was precisely those commercials that prompted me to start thinking about neighbourhood steak places! Boy, does Arthur's ever sound like my kind of place! Their 12 oz Junior Sirloin served with a side of potatoes is only $15.95.... Arthur’s only serves potatoes one way – a variaton of home fries on flavor steroids with bits of onion.... Basically, Arthur’s is a great place for steaks at a good price and without the pretentious crowds you’ll find in Manhattan. The House of Chan is fabulous! Great steaks served with onion rings, and the very best Chinese food I've ever had! Sadly the prices are just too high to be a proper neighbourhood steakhouse. I want to go there again soon anyway! The only question for me is always steak or Chinese? It looks very cool...inside & outside. I'd go for the Chinese food . I've had plenty of Canadian Thai (in Montreal) and a lifetime of Americanized Chinese ...but never had Canadianized Chinese! Surprised to see that the Scotch n Sirloin in suburban Rochester has closed. Sad. I've enjoyed my two visits to Rochester and I'd like to go back again. There are some notable differences between Americanized and Canadianized Chinese. Americanized egg rolls are shaped like a pipe, like Canadianized spring rolls. Canadianized egg rolls are flatter and wider. Sweet and sour chicken balls are a top seller in any Chinese restaurant in Canada, and well worth getting! 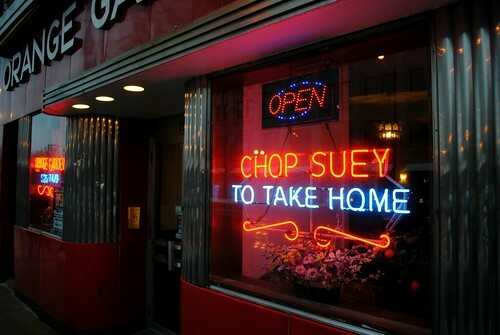 And chop suey is an omnipresent staple in Canada; not so in the States I hear. Here's a little article about NYC chop suey circa 60s. I have to take a look at the local takeout menus to see if how often chop suey appears. I haven't noticed it in quite some time. I'd definitely order it at House of Chan. CCinNJ I'd go for the Chinese food . I've had plenty of Canadian Thai (in Montreal) and a lifetime of Americanized Chinese ...but never had Canadianized Chinese! 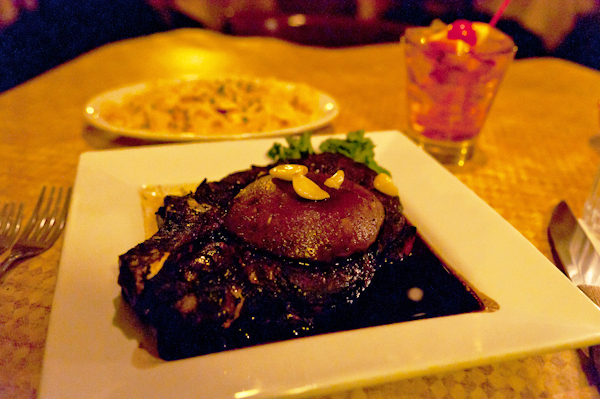 You might want to try Ruby Foo's restaurant the next time you're in Montreal. It's very well regarded. Although I've not been there in 25 years, I do remember that it was very nice. There's a Ruby Foo's in NYC. I love the Bento Box dessert! I'm allowed. I'm not on a Roadtrip. Hotel Ruby Foo's in Montreal looks pretty & fun. I will certainly check it out! IN Charlottesville it's the very old school Aberdeen Barn! Wow! It's still there?! I remember it fondly from my grad school years (1969-72) at The University. Fantastic! My youngest is, in a few months, getting married in C'vle. I'm adding the Barn to the C&O, and The Bavarian Chef on my eating list. Do you remember That Steak Place? They had the first salad bar I ever saw outside of a Smorgasbord. I've heard of That Steak Place but it's been gone a while. Do you remember where it was? Aberdeen just keeps on trucking. I went there for Restaurant Week last year and had a great time. I was not impressed with Bavarian. They have margarita machines now. Some of the dishes are slightly Polynesian. Confusion reigns. C&O is still very good and I've been really blown away by The Local in Belmont. That Steak Place, circa 1970, was on the west side of 29, north of Barracks Rd., next to Salem Eways, then a renouned purveyor of 'Oriental rugs'. Later, they opened in both Richmond and VA Beach. I have not been to the Bavarian Chef in years; but, seeing that it is still open I am/was "curious" for old time's sake. Les Allemond are always fond of mixing sweet fruit with pork, so I can see the 'evolution' to Polynesian. Thanks, you saved me a 60 mile round trip. BTW: in my years at The University, The Gaslight was the 'go to' for fine dining; in 1969 I actually met Col. Harland Sanders at the University Cafeteria on "The Corner". That, like Ed Michtom's, Eljo's, & the pipe shop are now long gone. Wintahaba: My husband and I went to Evans Farm Inn a few times in the early 1990s. I'm afraid it was starting to fray at that point, but the rural surroundings were still delightful. I only went to the Country Squire once -- in the mid-1970s. At that time, the place was owned by the parents of one of my college friends. I got to go back to the kitchen and watch the steaks being prepared. Orange Garden on Irving Park is a neighborhood spot that's been in Chicago since the 1930s. They have a wonderful old Deco clock on the wall in the dining room and a great neon sign. The best dish I've had there is something I've never seen anywhere else: sweet and sour egg foo young. Sounds strange, but it is delicious! Rumaki, Did you go to the Sitting Duck Pub in the lower part of Evans? They had a slightly different menu. Also was your college friends last name Johnson? Thanks for the comments. Never did go to the Sitting Duck Pub, just the main restaurant. And yes, the name was Johnson! In Columbus The Top Steakhouse is wonderful. Does no one remember the late lamented Manero's in Greenwich, CT? Sporty woodpannelled diningrooms with sports memorabilia (mostly old black and white photos) in the days before sports bars and wide screen televisions. Famous for the Manero brothers Nick and Tony, Tony being the 1936 US Open golf champion (as well as a winner of other tournaments), and for its garlic bread, shoestring fried onions and fresh cut steaks -- and for its long-term wait staff which would sing happy birthday whenever there was one and there always was. This area of Westchester/CT is a cradle of golf in the U.S. and home to many involved - as a competitor, promoter, writer or organizer - in professional and amateur sports. So a visit to Manero's was always an event, one for which people lined up around the block. Hey, MFL, would love to meet there some night.........sounds just like up Bob's alley! For several Roadfooders and former Roadfooders it's a favorite including myself. Jimmy cheffed at Pasquale's Manale in New Orleans and his BBQ shrimp app is outrageous as is his Bananas Foster. He always serves large seared sea scallops, and they come with an ever changing risotto. brisketboy Lots to be said for grilling your own. You always get it the way you want. That's one of the two reasons I've fallen well behind in sampling neighbourhood steak houses in Toronto. I've been buying the "Black Angus" New York sirloins at the Brown Bros. stall at the St. Lawrence Market and grilling them up on the BBQ myself. Their Black Angus steaks are far cheaper than "Angus" steaks of any sort but are entirely satisfactory quality wise. The other reason is that for the past few years I've been going to the very conveniently located Astoria Shish-Kebob House whenever I've had a serious craving for a grilled cut of meat. The Astoria's pork, beef, lamb and chicken souvlaki are very tasty indeed and I can stuff myself for a moderate price since a massive Greek salad together with a generous portion of rice, roast potatoes and garlic bread is included with each entree. Wish we had onne in Newark, De. Anyone know of one? We have a very cool, authentically retro steakhouse in Darien, CT. There's another one in CT, maybe Danbury. This place has not changed sinned the last 60's, it's a time warp going in there. Great steaks cooked on an "open kitchen" grill, before that was hip. Big traditonal salad bar comes with along with baked potato.